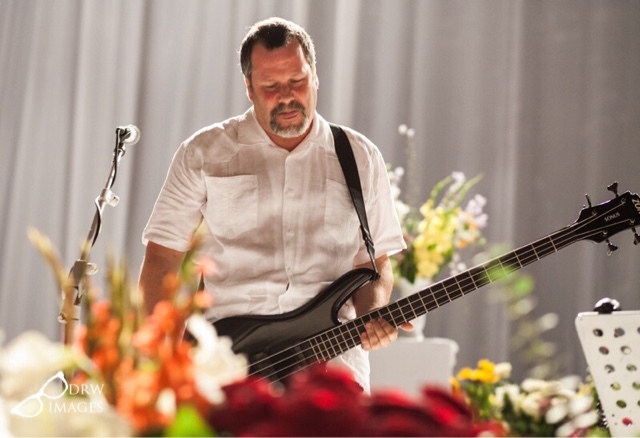 On this day five years ago Faith No More returned to their spiritual London home, Brixton. 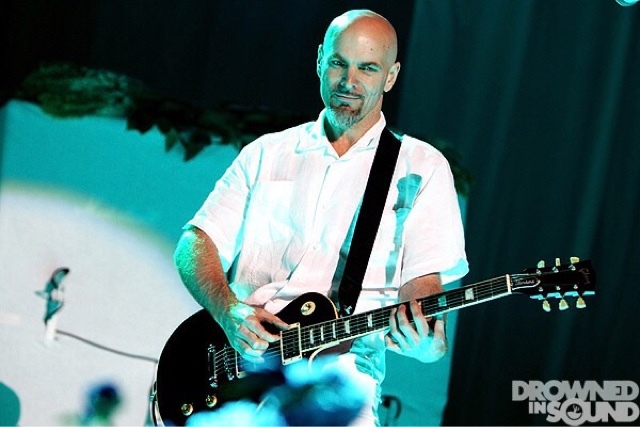 Their previous show at the hallowed ground was in 2009, their first show in eleven years! 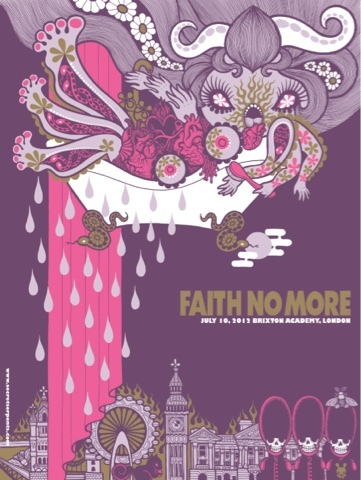 After this year’s Sonisphere Festival was cancelled, UK fans of Faith No More thought their chance of seeing the band play this year had been dashed, but the Gods were smiling on us and a few weeks later the band announced two shows in London to try and fill the void. Happy Days! 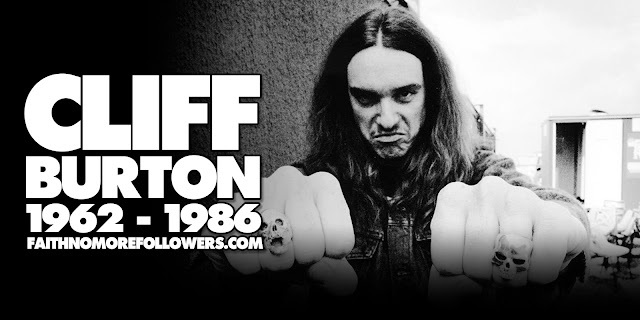 Obviously both shows sold out in a matter of minutes and thus as a lifelong fan I was one happy photographer come reviewer as I made my way down to the smoke. With the stage set all dressed out in white and decorated with more flora than they have at the neighboring Chelsea flower show, there was a palpable ‘hyper buzzing’ from the expectant crowd at what could be there last chance to see their hero’s in action. 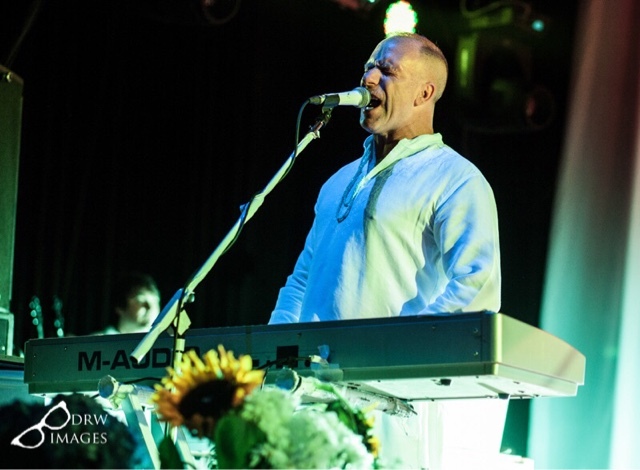 A single spot light shines on to keyboardist Roddy Bottum and BOOM! We are underway starting with the haunting eastern sounding intro of “Woodpecker from Mars”. 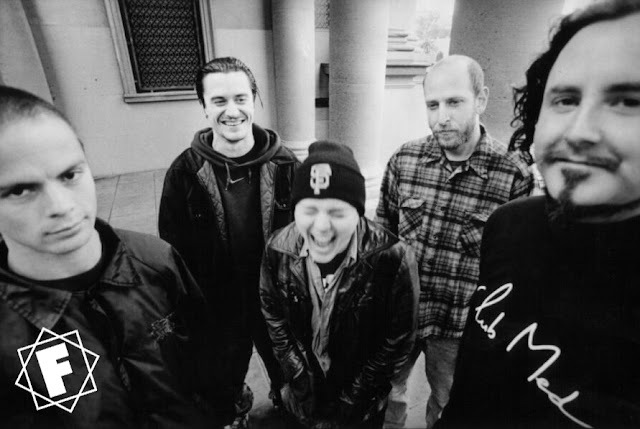 As the song kicked in with its stomping bass line the band – minus Mike Patton sound – as tight as they did the only other time I saw them live, way back in 1992. 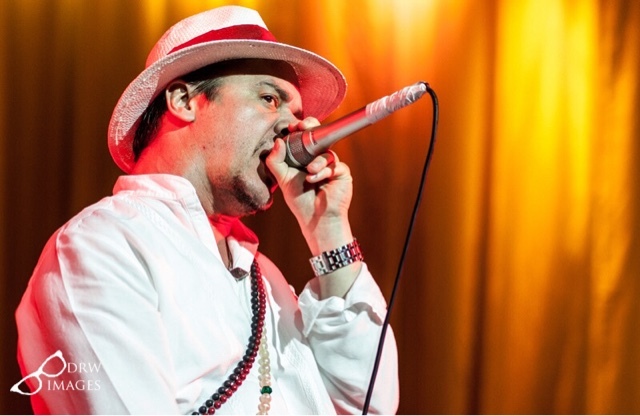 Then as the middle section of the Instrumental opener reaches its pinnacle, the song takes a twist in the way only Faith No More can do. 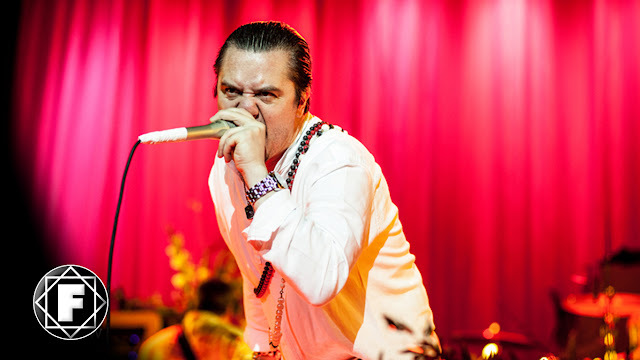 Out of nowhere it changes to “Delilah” with this Mike Patton makes his way to the stage, crooning ‘My my my…” and then before you know it back to “Woodpeckers from Mars” with Patton throwing himself across the stage. Immense! What an opening! What follows is like a greatest hits set, only better. The band is on fire playing with the passion of a new outfit, not one rumored to be calling it a day. With little between songs in the way of banter the band plough through “Midlife Crisis “ “Be Aggressive “ and my all-time favourite song “Caffeine”. This is followed a slower paced “Evidence”. 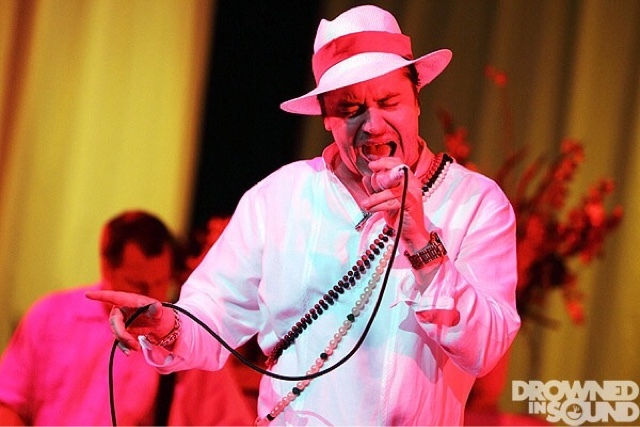 This change of pace demonstrates why Patton is such a versatile front man – one song his face and body contorted while he screams and makes noises only he can and then the next he’s back to crooning like he’s an honorary member of the rat pack with Frank and Sammy. The Songs sound as fresh and relevant as they did 20 years ago. I’d maybe even say they sound better than did before. As the band leave the stage after playing 15 tunes (all of “Patton” era albums), the crowd is as hyped as any I have seen in the last 20 years. We just don’t want this to end. As always Faith No More have a twist in mind. As they make their way back to the stage and everyone is wondering what classic they’ll encore with, they come out with a NEW song “Matador and with that crush the rumors of a split in a heartbeat. Phew! They then bowed out with 3 more songs 2 being non-Patton era crowd favourites “As the Worm Turns “and the finale “We Care a Lot”. And that was it… The crowd began to depart, but were left with the hope of a possible new album in the future. On a personal note I would like to thank Bianca from Gig Junkies for helping to make my attendance at this gig possible. Never did I think I would get to see my favourite band live again but to be able to photograph it as well was truly a dream come true. The band didn’t let me down as they were as good if not better than they were 1992.